This theme is a distillation of the sweeping vision which Metropolitan Joseph readily shared with us at the summer meetings in July, 2016. His Eminence spoke with farsighted boldness and passion about the many challenges and opportunities which lay before our God-protected Archdiocese. His vision is of a vigorous Church actively proclaiming our faith in Jesus Christ and lovingly ministering to the broken world around us. This is already a description of the ministries in many of our parishes, but to keep moving forward while broadening our active ministries, we must reinforce and strengthen our foundations. The Antiochian Women are always ready to “Encourage, Support, and Fund” the godly ministries of our Archdiocese. We have proved this, time and again, with many generous fundraising projects over the past 43 years. This year’s Project gives us an opportunity to make a significant contribution to strengthen the fundamental ministries of our Archdiocese. 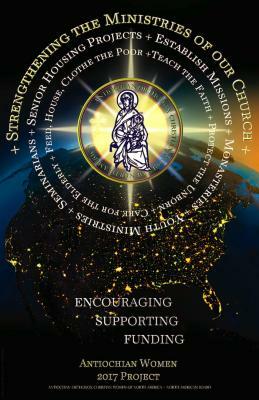 In the Project poster, the lights of the cities and towns across North America represent the thousands of faithful men, women, and youth of our Archdiocese showing forth the Light of Christ through their selfless ministries within the Church and to the world around us. The funds we raise this year will go to strengthen the following ministries in our Archdiocese: planning senior housing projects; founding missions; supporting seminarians; encouraging youth ministries; protecting the unborn; teaching the Faith; caring for the elderly and those in prisons, nursing homes and hospitals; helping to feed, house, and clothe the poor; and inspiring monastic vocations. Thank you, in advance, for your hard work and faithfulness. This entry was posted in Featured News, News and tagged God-protected Archdiocese, His Eminence, Jesus Christ Glory, Sayidna Joseph, Suzanne Murphy by Orthodoxy Cognate PAGE. Bookmark the permalink.